Nashville, Tenn. (September 18, 2017) — Various artists from the worlds of country, rock, blues, bluegrass and gospel are all banding together to aid victims of Hurricanes Harvey and Irma. A few weeks ago, after the landfall of Hurricane Harvey in Houston, country singer John Berry was scheduled for a writing appointment in Nashville with award-winning songwriter Chuck Jones. The two went into the session with no intentions but walked away with the newly-penned song, "All Come Together." After writing the song, Berry went to work asking friends to join in and help sing on the tune. He quickly recruited a slew of artists who were more than happy to donate their time and talents. 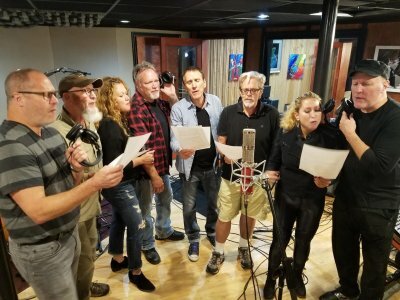 "All Come Together" features vocals from Berry and Jones, John Oates (Hall & Oates), John Cowan (Doobie Brothers), Keb Mo, Heidi Newfield (Trick Pony), Dave Innis and Paul Gregg (Restless Heart), Casey James (American Idol), Collin Raye, Bryan White, Robin Berry, Mike Farris, and Darin & Brooke Aldridge. The recording process was documented on film to create a music video to accompany the song. Watch the official music video HERE (https://youtu.be/FlT8o4BGthg). Grammy Award-winning country star John Berry has placed 20 singles on the country hit parade charts, six of which went Top 5 as well as a #1 on the Billboard and Radio & Records country charts. He has earned numerous Gold and Platinum records. Berry's co-written "A Mind Of Her Own" and "Kiss Me In The Car" introduced him to radio audiences in 1993. Then, "Your Love Amazes Me," "What's In It For Me" and "You And Only You" thrust him to stardom in 1994. "Standing On The Edge Of Goodbye," "I Think About It All The Time," and "If I Had Any Pride Left At All" were all major hits the following year. "Your Love Amazes Me" earned Berry a 1995 Grammy nomination. Berry took "Change My Mind" into the country music Top 5 in 1996. "She's Taken A Shine" became an even bigger hit in 1997. That same year, he was nominated for CMA Vocal Event of the Year for "Long Haired Country Boy" with Charlie Daniels and Hal Ketchum. Both fans and the media took note when "There He Goes" was released as a 1999 duet with Patsy Cline. Berry's two most recent albums, What I Love The Most and his holiday album, Christmas, are both available now at johnberry.com as well as iTunes and other digital retailers. Berry's new TV show, Songs & Stories with John Berry, airs weekly on The Heartland Network, The Family Channel, The Country Network, the Angel Two Network, AMG TV, Country TV (New Zealand), and Keep It Country TV (Europe). For more information, visit songsandstories.com.